Not sure, but I think I hear the name Riley when the dog is allowed on the bed. Maybe the dog’s name is Eddie and the character’s Riley? We will see soon enough. I think it’s a wonderful dog they found; perfect match for McG. I truly hope they won’t screw this up. This could be a great and wonderful addition. This entry was posted in Hawaii Five-0, News. Bookmark the permalink. you’re right… they don’t need to screw this one up! LOVE the puppy! Oh you are too funny. As I said, beauty is in the eye of the beholder. I’ve never heard of the eyeS of the tiger. LOL. You guys are killing me. HAVE YOU FORGOTTEN THE THINGS YOU”VE DONE TO THE MAN IN YOUR FICS????? You’re on a watchlist somewhere. I just know it. I am in love with this dog already could be my second fav character after Steve on the show. I hope we get lots of scene together and lets hope Peter and the writers don’t mess this up. My only complaint was that the clip got cut short. Dang I wanted to see the pup cuddle up to Steve in bed. Eddie or Riley is fine with me. I tried to show this to my Nova so that she would know how to behave and of course she ignored it. I was sure that she would find him her new crush and we could watch 5-0 together. Oh well. Hm, I don’t think it’s Steve in the bed. What do the others think? Pinsel has a thing for dogs like Eddie/Riley. They would make beautiful puppies. If she could. But nope, she can’t. Snip snap. I’ve watched the clip several times and it sure sounds like Steve in the few words I heard. I think that dog has a sweet face. It doesn’t look like Casa McG but hey, everything is possible. But I’m tremendously looking forward to this cute furry guy and I think he’ll be a wonderful partner for McG. Did I say partner? Lol! Doesn’t look like Steve’s house or bedroom location to me. Then again, it IS H50 – and that could randomly change for no apparent reason. But they can’t change his voice, or his hands. NOTASLONGASIHAVESOMETHINGTOSAY! That wasn’t Steve. I think that’s the original owner. Any dog would love McGarrett. As really next to Grover, this dog understands Steve! 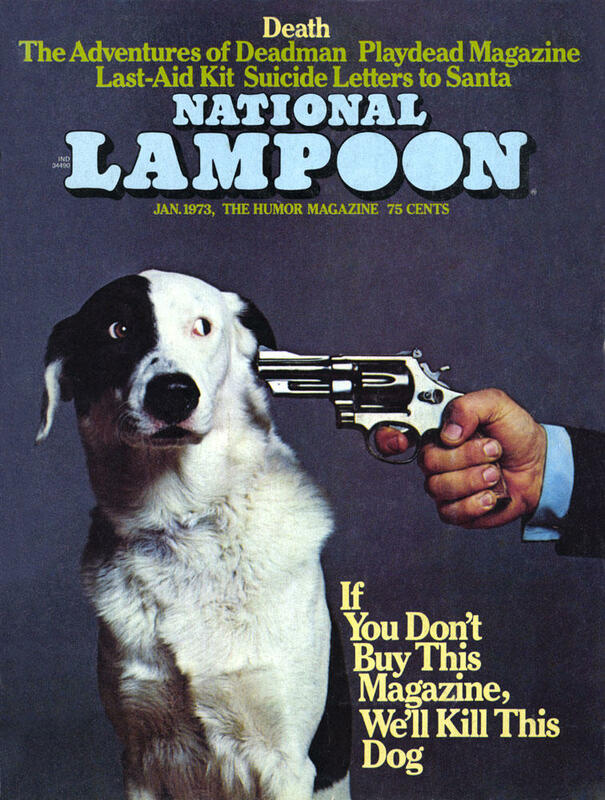 Don’t laugh, I wouldn’t be surprised to see Lenkov make a tweet along the same lines as this famous cover from National Lampoon saying “If you don’t watch (or like) this show, I’m going to kill this dog,” LOL. oh, i’m so looking forward to his arrival. i assume this scene is from the beginning of the episode before the owner dies, so this is his original house. Could someone who hasn’t been blocked by the EP tweet him and ask if McEddie is endgame for Steve’s romantic life? I am not joking. Would someone be willing to really do this? The dog is adorable (all dogs are though!) But I love this clip. Looks like they changed the dog from Lucy to whatever his name is. Guess the only dude that’s gonna be in McG’s bed is a dog #SorrynotSorry. He is the wonderful, beautiful, cute, strong, dedicated, supporting Blondie in Steve’s life now! Dannoying is history. Steve loves his furry partners – but only those with paws. At least won’t be some blonde who is super cute, fun in bed and has her phone number written on the bathroom wall of a gas station. Just sayin……………..
Didn’t Steve get angry at Danny for wrecking his house, trying to set the kitchen on fire and letting his dog sleep in Steve’s bed? Interesting to see if he lets Eddie rest his head on the other pillow. Season 2, Steve let Danny house sit while he spent V-Day with Cath. & 5000 other sailors (good times). Danny always looks like a unmade bed, I’d be surprised if his dog didn’t also have Danny’s cooties. I don’t think that was Steve’s house and while it did sound like Steve, I don’t think it was. IF it was Steve, he got a new cover for his bed. And while he SHOULD have a new cover (the old one is truly ugly in my opinion), I don’t think that was him. Okay it still sounded like Steve at the end but I am often wrong. Leave it to PL to jerk fans around that way. Don’t tell me he didn’t expect fans to assume it was Steve. I agree, Moonjat, it did sound like Steve, but I think that was just a ploy and a teaser. I don’t think that was Steve’s house at all. If I know a room in Steve’s house, then it is his bedroom. And he has no window to the left of his bed. There we find the dresser. You know, the one with the drawers. You McRoller SHOULD know this. And Steve does not need no stinking sheets. Not in my world. The bed cover needs to go. Just pass a blue light over it, then bag, and tag it.